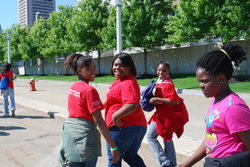 Members of Lady Bound participated in the Cleveland Diversity Walk. The girls walked 3 miles to promote diversity and was rewarded with admittance into the Rock n Roll Hall of Fame and the Cleveland Science Center. This is the 2nd year that Lady Bound participated in the Cleveland Diversity Run, Walk and Roll. Lady Bound girls at the Cleveland Diversity Walk. 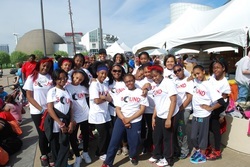 The girls participated in a 3 mile walk to promote diversity and received complementary entry into the Cleveland Science Center and Rock Hall of Fame. 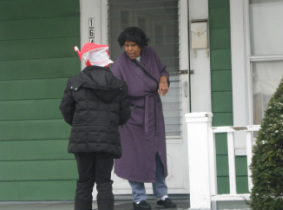 Lady Bound girls delivering Christmas cards to neighbors in the Hough neighborhood. 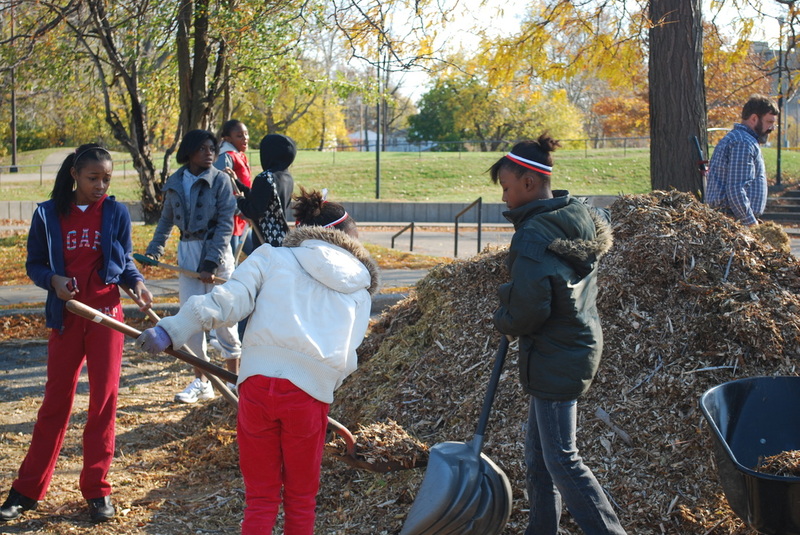 Members of Lady Bound volunteered to tutor younger students at Euclid Park School during their lunch hour. 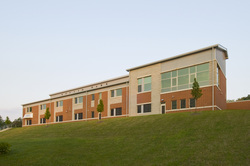 Lady Bound members would eat lunch first and then go to their assigned primary grade classroom to help students in reading, math and grammar. 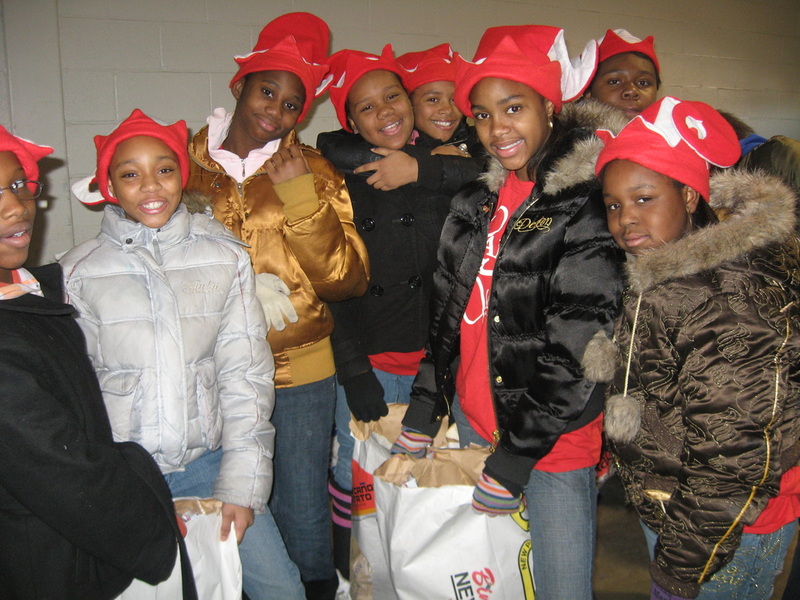 Lady Bound girls helping to package and deliver food baskets to needy Cleveland families at the Cleveland Food Bank. Lady Bound girls restoring and revitalizing the playground at John W. Raper School in Cleveland, Ohio. 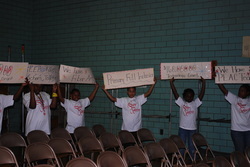 Lady Bound members rallied with the community to help stop the closing of John W. Raper School. Each member created a sign and participated in a silent protest for the school. Lady Bound girls raised money and completed the Walk-a-Thon for the American Heart Assocation of Greater Cleveland. Members of Lady Bound participated in the American Lung Association Walk-a-Thon and raised over $300.00 to donate to the organization. 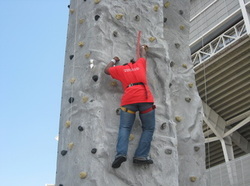 The picture to the left shows the girls participating in a rock climbing competition after completing the 3 mile walk. 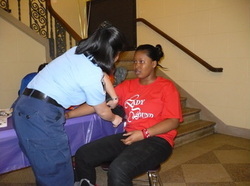 Members of Lady Bound participated in the Cleveland Girls Health Summit where they received health screenings, learned about fitness, high blood pressure, obesity awareness, responsible sexual behavior, and healthy food choices. The picture to the left shows Chrishawna Fowler getting her blood pressure checked.